On Wednesday night (7PM ET) the Bucs take on the 10-3 VCU Rams in the Dome. VCU is ranked just outside of the top 25 (26th in Coaches Poll). This VCU team is the highest ranked team to play ETSU inside of the dome since the 1998-1999 season when ETSU hosted two top 25 teams. Michigan State who was ranked 14th at the time and the College of Charleston who came to Johnson City ranked 20th in the nation. Coming off an enthralling Final Four run, VCU held mixed expectations last year. Four seniors were gone and head coach Shaka Smart had the ninth-youngest team in the country. 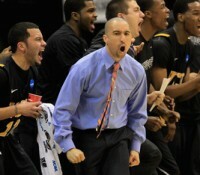 If there was ever a validation of a program on the rise and not a one-hit wonder, or fluke, it’s what VCU accomplished. The Rams won the CAA championship, beat Wichita State in the second round of the NCAA tournament, and had a game-winning shot to put them into the Sweet 16 bound off the front rim.It was a wild, havoc-fueled ride. VCU led the country in steals (381) and steals per game (10.6). The 381 steals is the highest single-season total in college basketball the last four seasons. VCU also led the country in opponent turnover rate (27.3), steal percentage (16.0), turnover margin (+6.5), and turnovers forced (17.9 per game). Think havoc is a fast paced game? The Rams also held 17 opponents to 60 points or less, the highest such total in school history. Success indeed begins at the defensive end. “Briante saved us,” recalls Smart, speaking of freshman guard Briante Weber. “Briante gave us swagger. [Senior] Brad [Burgess] was great, but he was a businessman. Our two 757 guys (Weber and Darius Theus, who hail from Virginia Beach area code 757) brought that attitude, that swagger. We needed it to win.” And when it all ended, VCU announced over the summer that it would join the Atlantic 10 conference, moving out of a CAA it had called home since 1996. Briante Weber (3.5 ppg, 1.9 apg) is a joy to watch play — high energy doesn’t even begin to describe the 6-3 sophomore, who led the CAA with 77 steals and led the country in steal percentage (7.01) and steals per 40 minutes (4.6). “When he is at his best he is havoc,” Smart said. Weber has more than just defensive gifts with his length and instincts. He posted a freshman-unusual 1.3-1 assist-to-turnover ratio. Like Graham, Weber has room to grow. “He has unbelievable potential, but until he falls in love with the game, he’s going to be a role player,” Smart said. “He has to get much more serious about the craft — attempt to master ball handling and shooting.” Smart has an eye-catching big man in Juvonte Reddic (10.3 ppg, 6.7 rpg). The 6-9 junior dominated games last season, showing off an array of moves from baseline to free-throw line. Reddic posted 10 double-doubles and handles the ball well for a man his size. He dropped 28 points on William & Mary by scoring on steal/length-of-court drives, jump hooks, and smooth drop steps. Fellow junior D.J. 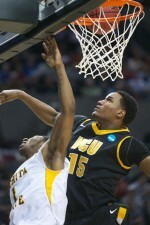 Haley (3.2 ppg, 3.9 rpg) stands a full 7-feet tall and is a rock solid 260 pounds, but he can move for a man his size. Haley is a bit of a renaissance man, sporting a full beard, quoting Thoreau, and playing piano. On the court he does everything that allows the stars to be stars — set screens, crash the boards, and distribute the basketball. Haley’s ability to play more than short bursts — he battles asthma — could make him dangerous. Teddy Okereafor (0.8 ppg, 0.5 apg) played sparingly into the middle of the season but more as March drew near. The 6-4 sophomore played his best game of the season — eight points and two assists in 14 minutes — against Northeastern in the CAA quarterfinals. Okereafor is the primary backup at point guard and played well during the team’s trip to Italy over the summer. Two 6-8 players, sophomore Jarred Guest (0.9 ppg, 0.6 rpg) and senior David Hinton (0.2 ppg, 0.3 rpg) will battle for frontcourt time. A sure sign that VCUs success is gaining national attention: Smart landed two top 100 recruits in his freshman class. Melvin Johnson, a 6-3 combo guard with silly range, committed in late July. Johnson is a smooth scorer who averaged 20.8 points and knocked down 82 3-point field goals in his senior high school season. ESPN rated him the No. 14 shooting guard in the nation and a four-star recruit. “He can put the ball in the basket at a high rate,” Smart said. A familiar name is 6-5 wing Jordan Burgess, the younger brother of just-graduated Bradford Burgess. Jordan steps onto campus with a college body and a mean streak that won’t allow him to be intimidated. “He will play but he’s got to go take someone’s minutes,” Smart said. “There is a relentlessness to him.”ESPN rated Burgess a four-star prospect and also the No. 24 small forward in the country. Justin Tuoyo is the third member of the freshman class. The 6-8 Tuoyo has the farthest to go from a strength perspective, but Smart notes “he is a sponge and a quick learner.” Those attributes lend well to a redshirt season. Smart is undaunted by moving to the Atlantic 10. “We could play on Mars and it wouldn’t change our personnel or style of play,” he says. “There’s certainly an element of preparing for a season that will be new and different, but for us it’s giving the players the best understanding of what it takes to win one game, a stretch of games. It takes playing hard, playing smart, and playing as a team.” VCU got a jump on its season with a summer tour of Italy in which the Rams beat four teams by an average of 54.5 points. Smart points to the camaraderie and 10 practices as very important, perhaps more important than the actual games in Italy. “The important thing for us is that we need to get our guys in the right frame of mind where they set aside any personal agenda and focus on the common goal of winning,” he said. Winning isn’t a foreign concept. VCU is one of four programs in the country to post at least 24 wins each of the last six seasons (Kansas, Memphis and BYU are the others). Considering VCU has gone 15-5 over the past 10 seasons against current A-10 teams, the winning appears to be here to stay. It’s hard to poke holes in VCU: they score often (36th in the nation) and efficiently, and force more turnovers than any other team in the nation. They manhandled FGCU and Stetson, beat Belmont by 10, and lost to no.1 Duke by 9. Led by Juvonte Reddic, the 6’9″, 235 lb energetic, jumping jack, VCU has 3 more double-digit scorers: Graham, Daniels, and Brandenburg. The 6’4″ Daniels has hit 50-3’s this year at a scary 43% clip. As in most games this season ETSU will have to play tough defense if they want any chance at all to win this game. The Bucs will also need to find a way to get out of their shooting slump. ETSU is currently 335th in the nation in scoring and 339th in FG%. This will be the first game of the season with the new lighting rig in the dome.